Moving into a new home is always stressful, but it’s also among the most enjoyable things in everyone’s life. Exploring new space and adapting it to your own needs is one of the elements of owning a new home that fills you with excitement and joy, especially knowing that you’ve finally found a place you can call your own. In the process of making this space work for them, lots of people focus on their kitchen as one of the focal points of the new home, and an area where they’ll spend a considerable amount of time. If you want to end up having the most perfect kitchen in the world, you need to build it from scratch and make every single element work for you. If you’re currently in the process of doing that as well but are still unsure how here are a few ideas that might help you finish the job. This is the first thing you need to do before moving into any space, and it’s particularly important in the kitchen. Repainting the walls isn’t just going to make this space more visually appealing and welcoming, but it’s also going to give it a new character and make it unique. In the end, it’s good for the overall hygiene and health of your new home, so don’t be afraid to pick up a brush and start painting! Choosing the color for your walls will be the first important decision you’re going to make in the process of building your kitchen from scratch. There are lots of ideas you can explore, but it seems that the majority of people are picking colors like classic navy, light green, teal, gray and paper white. 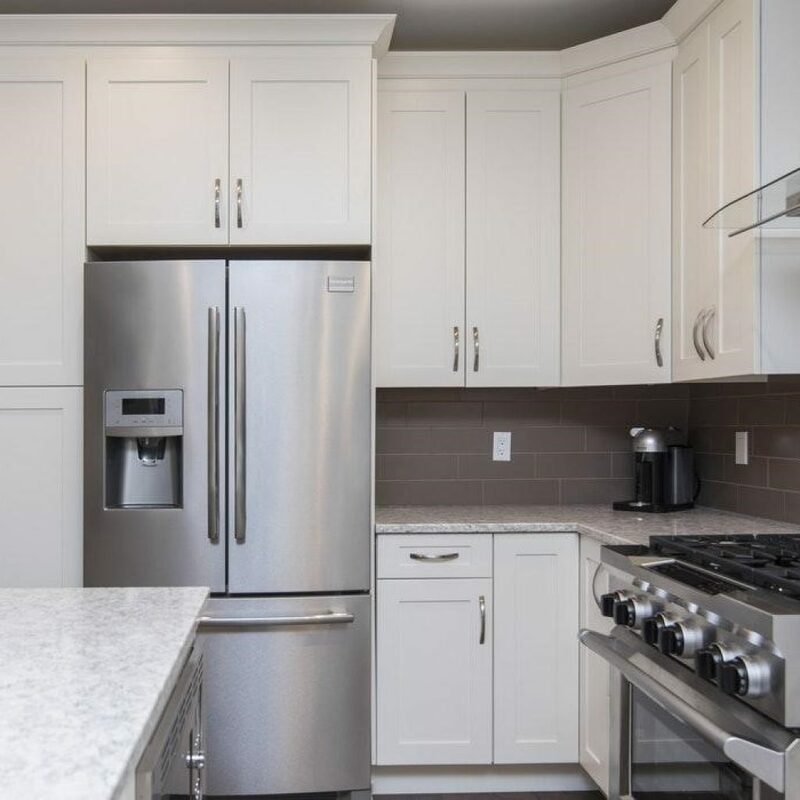 Of course, you can always opt for other color choices, but keep in mind that the color you pick for your walls is going to determine the color scheme of your entire kitchen and define the color of your cabinets, countertops, kitchen island and everything else. In other words – take your time and choose carefully! If you’re not a fan of repainting the walls entirely, you can always opt for tile instead. Doing this is, admittedly, harder than painting, as well as pricier and more time-consuming, but tiles are easier to clean and maintain on a daily basis, and they could really take the visual appeal of your kitchen to a new level. That’s why backsplash is among the most popular ideas out there, and something more and more people around the world are using. However, combining backsplash tiles with exposed walls is a great way to make your kitchen stand out and become the most attractive part of your entire house. So, install backsplash behind your appliances as this is the area that sees the most action and is likely to get dirty on daily basis – that way, you won’t waste too much time cleaning after cooking. After that, just apply a new coat of paint on the other walls in your kitchen, and you’re done! Color-coordinate these two areas and they will blend in together naturally as if they’ve always been there. Look, you may not be the best cook in the world, but that doesn’t mean you don’t deserve a decent kitchen. Even if you’re able to prepare just a handful of dishes, you should still perfect them, and in order to do that, your kitchen needs all the right appliances – a fridge, a microwave, a dishwasher, a range, and a stove, to begin with. These will help you fall in love with cooking, and eventually turn you into a really good cook. No matter how big your kitchen is, you’ll be faced with a number of possible layouts you could explore. These depend on the size of your space as well as with your own preferences, and the point in building a new kitchen from scratch is having the freedom to using a layout you consider to be the most perfect. The first thing you need to do is think about how you’re going to use your kitchen, and how often you plan on doing that. People who aren’t the biggest cooking aficionados in the world don’t need to pay that much attention to the layout because basically anything they pick is going to suit their limited needs quite perfectly. If, on the other hand, you’re one of those people who love spending time in the kitchen, you need to define your work zone, storage zone and eating zone as well. Give each of these enough space and don’t cram too many things into your kitchen unless you want it to feel cluttered and too tiny. This is another crucial element of a perfect kitchen and something you mustn’t forget when building it from scratch. First, inspect the floors in your new home and find out how good they really are at the moment. If there’s no need to repair them or install new ones, you can just spice them up and save a considerable amount of money that way. But, if you notice there’s anything wrong, call an expert and conduct a more thorough inspection. If you’re trying to be frugal, laminate, vinyl, and cork are the way to go. These are affordable, easy to install and even easier to clean, and they’ll prove to be quite all right, especially for people who aren’t planning on using their kitchen that frequently. 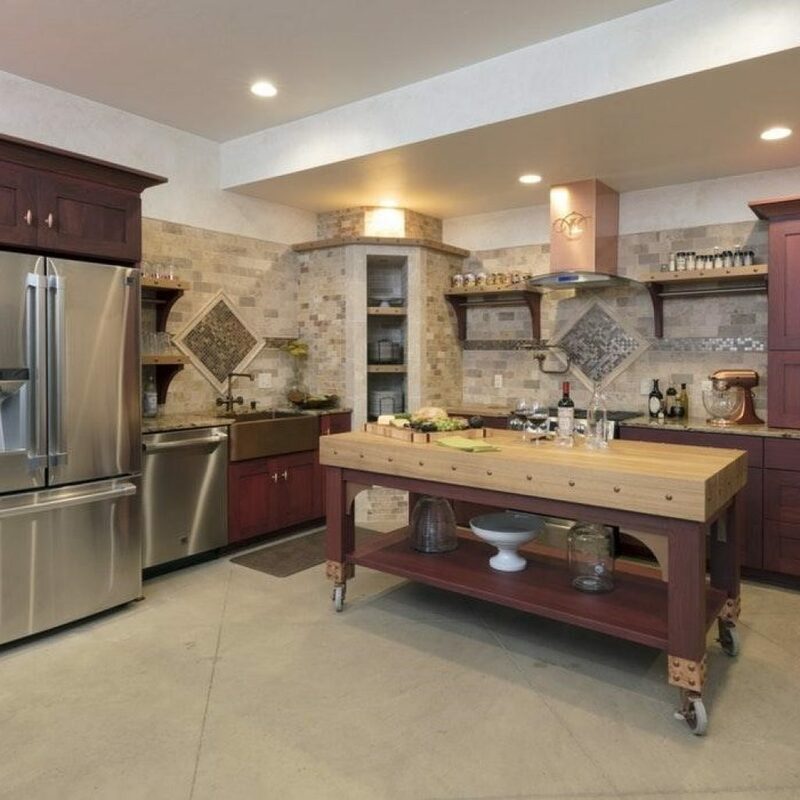 Alternatively, go with hardwood, bamboo or ceramic flooring, as these options are durable and visually appealing, and will help you feel better while you’re cooking. 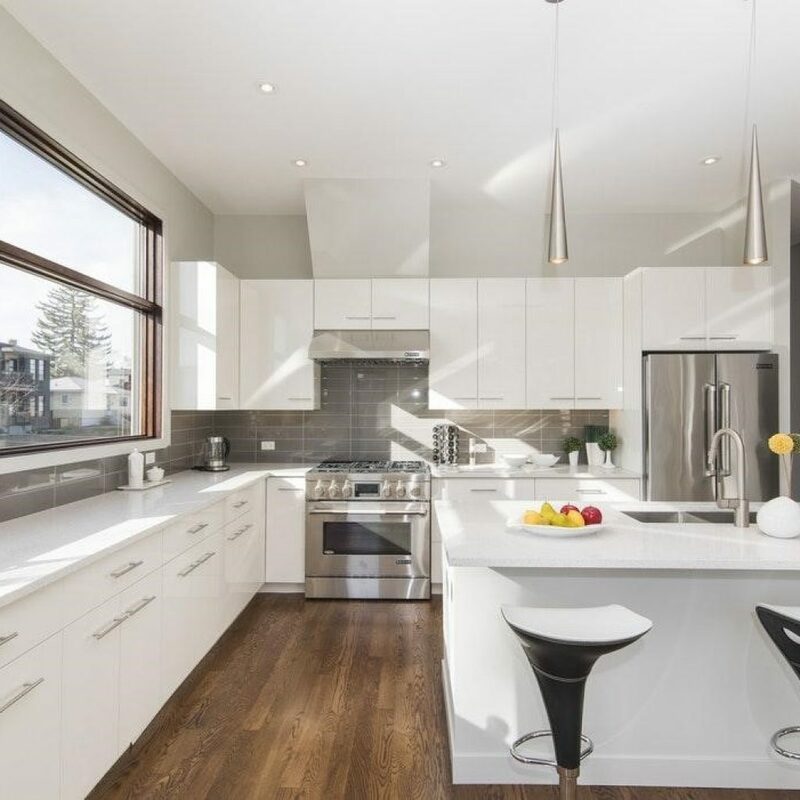 Now that you’ve taken care of these vital things, it’s time to pick the cabinets, find the right countertops and design a proper kitchen island. Building a perfect kitchen is never easy, but it’s something you need to do if you want to be able to prepare healthy meals every day of the week.